The battle for the league title continues. 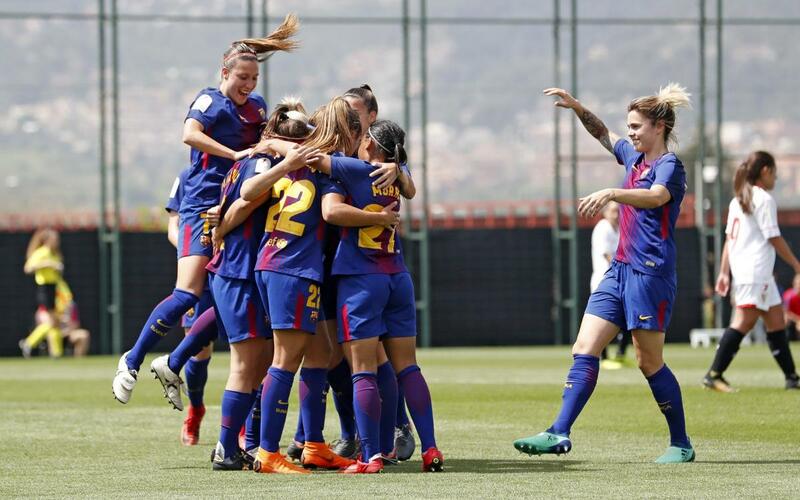 Barça Women keep up the pressure with three points thanks to an invigorating 5-0 win over Sevilla. Mariona grabbed a brace with Alexia, Bussaglia and Martens getting the others in an impressive performance from Fran Sánchez’s team. Chances came early in the contest for both sides with Barça keeper Paños making an excellent save to deny Sevilla’s Amparo. After wasting a couple of good chances, the home side took the lead in the 14th minute. A perfect cross from Martens was finished off in style by Mariona to make it 1-0. The visitors did not fold after falling behind early on and struck the post before Barça found the net for a second time just before the half hour mark. Mariona scored her second of the game with a solo effort and just five minutes later Alexia made it 3-0. That is how the teams went in at half time with Barça in complete control. In the second half Sevilla began strongly, looking for a goal that would get them back into the game. However, the best chances fell to the home side and Bussaglia added a fourth from the edge of the box. Before the final whistle there was still time for Martens to score a wonderful with a dipping effort that exemplified her excellent this season. In the end, the blaugranes took a 5-0 victory over Sevilla for the second time this weekend.